Today, dozens of field service organizations and field service vendors gather in sunny Palm Springs, CA for Field Service USA, an event designed to provide service and support executives with best practice strategies, education, and inspiration to help them achieve their goals for 2014 and beyond. As a part of this great event, we starting thinking about field service organizations, and the challenges they face on a daily basis. In 2014, the field service organization is full of potential, but also wrought with competitive, financial and technological challenges that often keep them from meeting their potential. In order to keep customers satisfied, they must differentiate from their competition, usually by embracing consumer technology as quickly as their customers do. But when faced with a never ending list of new trends, as well as a list of KPIs and company goals, all while trying to increase revenue, what should key decision makers within field service organizations do? How do they pick what will work best for them? How do field service organizations pick which trends will work for their business? How do they keep on top of the changing demands of their customers? Business intelligence, industry analysts, and continual education. Organization should use the BI from all of their implemented software solutions to help them gauge customer expectations, guide R&D developments, and tweak their operations for better efficiency. They should use the guidance and invaluable research provided by industry analysts to help them to understand their changing customer base as well as the changing market. And they should continually educate, with training on new technologies, customer service, and on the products themselves to understand the world both inside and outside their organization. You are telling us things we already know, you may be thinking. So what’s the point? The point it; ServicePower gets it. Did you know that we specifically employ people with a field service background? We seek to understand the field service organization at all levels, not just from a field service management perspective. We understand the challenges you face, issues with budget, compliance, consumer trends, SLAs and more. 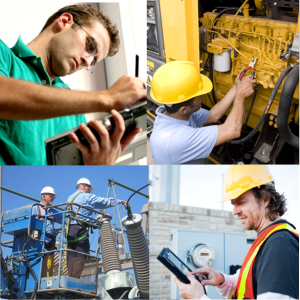 We don’t just want to deliver you a field service management solution and be done with it, we want to give you the lasting support you need to be successful, in 2014, and in the future. We want to provide you with a strong product that gives you the business insight you need, bridge the gap between you and the industry analysts by providing you with their research and more, and facilitate an ongoing education process for you. Meet us at Field Service this week and let us show you that we aren’t just selling you an FSM solution, we understand your needs at the core.